I had some modifications done to mine and I still received it in under a week. Great product and fantastic customer service. This handcrafted 36” elliptical Fire Pit sits approximately 20”off the ground. 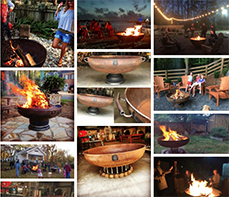 This fire pit is all hand-welded; it has a flanged tank head for a base, the hidden handles are made using re-purposed truck springs, has a 1⁄2” drain hole to keep water out, comes with a free handcrafted 46” Fire Poker, and this fire pit is designed to easily service 2-15 people at any gathering.